If the number of Ebola cases continues to rise exponentially over the coming months, FEWS NET anticipates that a major food crisis would occur. Under such a scenario, fears of the disease and official restrictions on movement would severely disrupt market functioning, contribute to significantly below-average household incomes, and lead to food shortages at local markets. Large populations would face moderate to extreme food consumption gaps, equivalent to Crisis (IPC Phase 3) and Emergency (IPC Phase 4) food insecurity, by March 2015. Households with family members who have been ill or have died from Ebola, as well as poor households dependent on markets to access food, would face the most severe food security outcomes. In addition to efforts to reduce the spread of the disease, contingency planning for an expanded emergency food assistance response is urgently needed given that the size of the food insecure population could be two to three times higher than currently planned. The availability of food on local markets will be severely disrupted, due to increasing trader fears of contracting Ebola, official and unofficial restrictions on population movement, increased trader and importer operating costs, market closures, and the possibility of currency depreciation. Reduced incomes will limit household food access, even if it is still available at local markets. Both rural and urban households would experience significant declines in income from most sources (e.g., agricultural labor, petty trade, and the sale of forestry products, bush meat, and crops) due to the effects of a general economic slowdown and major market disruptions. Main season rice harvests will be average to below average. 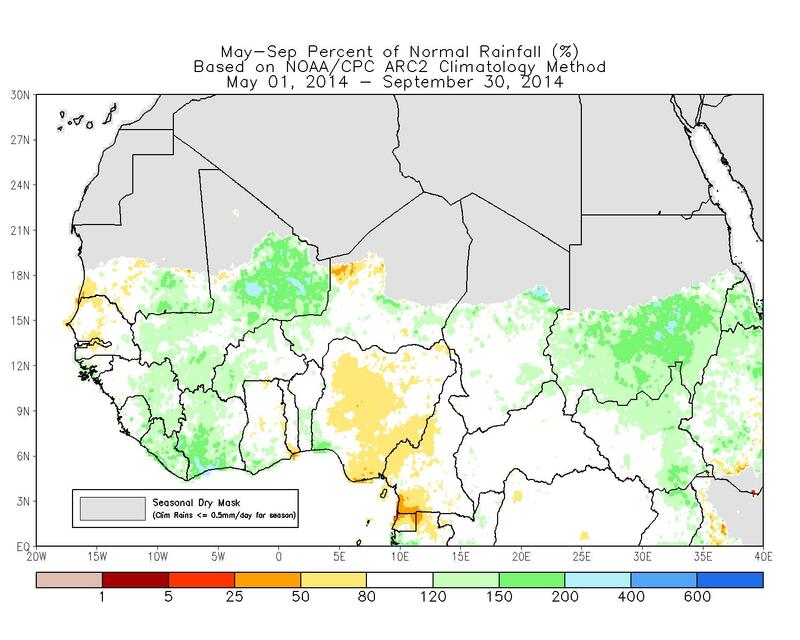 In most areas, favorable 2014 rainfall conditions contributed to normal crop growth and development. However, in rural areas worst affected by the outbreak, recent reports indicate that some fields were abandoned and that collective harvesting teams have quit operating. Instead households in these areas are generally harvesting using only family labor. This may lead to slightly below-average harvests in localized areas, particularly those where landholdings are comparatively larger. For households with members who are ill or have died from Ebola, the loss of productive household members will also contribute to below-average harvests. Agricultural households will increase consumption of locally produced cassava, delaying the need to source food from local markets. Cassava harvesting occurs year-round and requires less labor for harvesting than other crops. However, given the quantity of cassava currently planted or available on markets, this increased reliance on cassava will only partially mitigate the food consumption gaps brought on by reduced market functioning. In the scenario described above, elevated levels of food insecurity would occur in all three countries for both households directly and indirectly impacted by the Ebola outbreak. For households with family members who are ill or have died from Ebola, below-average harvests and incomes due to the loss of productive family members, along with difficult physical access to food due to household-level quarantines and social stigma, would significantly limit food availability and access. For these populations, moderate to extreme food consumption gaps and a sustained deterioration in the nutritional quality of household diets, equivalent to Crisis (IPC Phase 3) or Emergency (IPC Phase 4) food insecurity, would be likely between now and March 2015. Similarly, for poor market-dependent households impacted by the economic impacts of the outbreak, food shortages and a significant deterioration of purchasing power would severely limit food access and result in similar outcomes. Similar to a normal year, poor agricultural households will rely on their own staple food production for two to six months, depending on the area. Once these stocks deplete, sometime during the first quarter of 2015, these households would become increasingly reliant on local markets to access food. However, given market disruptions and reduced income from crop sales and labor, household purchasing power will be limited. Even assuming that increased cassava consumption occurs, Crisis (IPC Phase 3) or Stressed (IPC Phase 2) food insecurity is expected among these populations, depending on the area. Under this scenario, the size of the population requiring emergency food assistance could be two to three time higher than the current WFP regional Emergency Operation which targets 1.36 million people with food assistance by late February 2015. Measures to reduce the spread of Ebola are needed to avert the scenario described above and should remain the response priority. If these measures are successful, or if other factors, like changes in human behavior, slow the transmission of the disease, food security outcomes could be much better than expected under a scenario with 200,000-250,000 cumulative cases. However, contingency plans to mitigate the potential food security impacts should be developed given the potential size of the acutely food insecure population. These plans should consider emergency food assistance along with strategies to support market functioning, including import operations and the flow of goods between regions. Finally, given the rapidly evolving nature of this crisis, key drivers of food insecurity need to continue to be closely monitored. These include: 1) the location of official and self-imposed restrictions on population movement, 2) changes in port functioning and trade flows of both staple food imports and key commodity exports, 3) 2014/15 crop production levels and labor availability, and 4) the impacts of these factors on market functioning and livelihoods.